You start of with preheating the oven to 220°C. Roll the puff pastry 1cm thin and cut it into 8 squares (if ready rolled, cut the puff pastry into 8 squares). Then you have to core the apples and slice thinly. Cook them in hot water with 1 tablespoon sugar and 2 teaspoon cinnamon. Let it cook for 5-7mins. Don't over cook it! Then use some of the sugar and cinnamon water (from the cooked apple) and add 2 tablespoon of strawberry jam (or any desired jam flavour) and 4 tablespoon of sugar. Let the mixture cook, until its thin (cause it will thicken once it's cool). Spread butter on a baking tray (this will make it none sticky) and spread very little butter on top of the cut puff pastry. 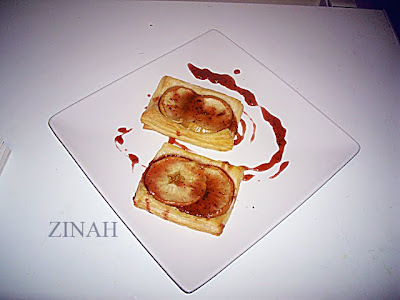 Put apple on top (2 slices for each square will do) and bake in the oven for 12mins or until puffed and golden. Once this is done, spread the jam mixture on the pastry while its hot. This shell serve 4-8 people (depending on how many slice each person eats).